While the issue of maintenance-related downtime has long presented challenges for manufacturers, the process of predictive maintenance has been a useful tool in reducing the risk of expensive facility downtime. Based on condition monitoring, essential components such as hydraulic pumps are fitted with sensors with upper and lower limit values for the sensor signals and alarms based on the operating instructions and experience of past values. This enables manufacturers to make better-informed decisions around when to replace the components of vital machinery. The latest technologies, brought about by the arrival of Industry 4.0, are now moving this function to a truly anticipatory approach to equipment maintenance. Generating far more reliable predictions and recommendations based on machine health and knowledge, these systems and interpret real-time data to facilitate the implementation of anticipatory management measures. To that end, simply installing the means through which big data to be collected is not enough; manufacturers must combine it with human intelligence. Just as when looking at the far-reaching possibilities of Industry 4.0 as a whole, a digital movement can’t achieve results on its own. Essentially, it must be combined with intelligence – human intelligence. To render this data useful, it must be visualised, evaluated and acted upon. 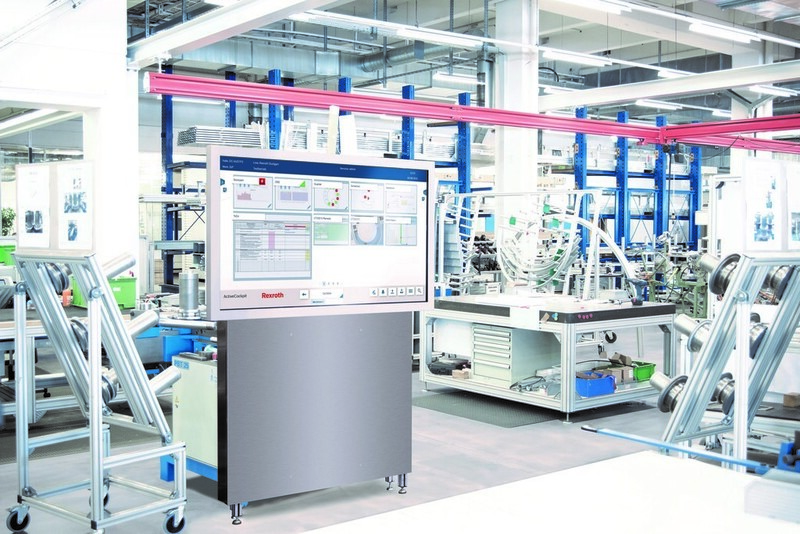 One way of doing this is through ActiveCockpit, a tool developed by Bosch Rexroth which makes it simple to collect, process and visualise the relevant data of a manufacturing facility. By translating complex data collected from vital machinery and presenting it in user-friendly visuals in real-time, faster and more accurate decision making can happen on the shop floor. In practice, this means systems and processes can be adjusted in-line with findings to achieve tangible results, immediately. To make that happen, algorithms and mathematical models are constantly at play behind the scenes. These are written to make the best use of big data and combined with huge computing power to enable software to use the data for itself, connecting patterns, pathways and predictions to be visualised. Once acted upon, changes can be evaluated to facilitate continuous improvement through machine learning. So as technology evolves to capitalise on the presence of big data, the primary drivers for manufacturers to implement these Industry 4.0 developments remain the same: to reduce costs, elevate levels of quality and increase output. On the factory floor, that can translate into a health index programme for predictive maintenance, so components are replaced at the most optimum time, taking into account factors such as asset health. One key advantage of this approach is the accuracy of fault finding and prediction capability. Statistically, in a given case, detecting a fault by chance carries a probability of just 13%, a figure which is increased to 43% with expert human monitoring. Couple that with machine learning, however, and fault detection accelerates to 95%. The ODiN system, which incorporates self-learning algorithms and predictive maintenance software, is a practical solution which is able to deliver a health index of connected machinery. Providing an indication of machine condition, manufacturers are equipped with the insights they need to maintain consistent levels of productivity and reduce the occurrence of unexpected downtime. To capitalise on the benefits these systems can bring, it is essential to work with the right partner to ensure equipment is being appropriately adapted to perform in the digital future. Accommodating intelligent sensors, controls and drives forms the basis for comprehensive predictive analysis and, connecting it to an end-to-end system perfectly aids ongoing machine learning. So as data harnessing and visualisation drives our software to become smarter and our factories more intelligent, it also facilitates the process of upskilling for those on the factory floor as human intelligence becomes increasingly valuable in the digital future.